The Rose Valley Centennial Foundation has accomplished has already accomplished a number of projects in the Community with the help of the Boy Scouts of Troop 272 and a number of dedicated residents. 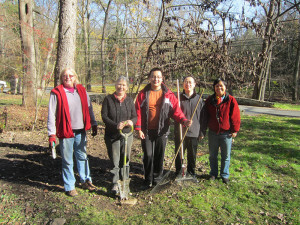 Do you have a project for the RVCF to consider or want to volunteer to work on an upcoming project? Please contact info@rosevalley100.org is you do. 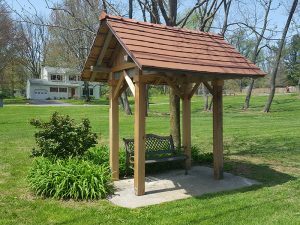 In 2017, Eagle Scout Will Swartentruber completed a renovation of the crumbling bus stop at the corner of Rose Valley and Brookhaven Road. In the process, he transformed it into a gateway to our arts and crafts community with a tile roof to join the 5-petal rose that blooms beside it. And the flag still waves on holidays. The original gatehouse project continues to mature and become more beautiful – Here are some photos and a video of the Rose Valley Heritage Garden and Veterans Memorial. 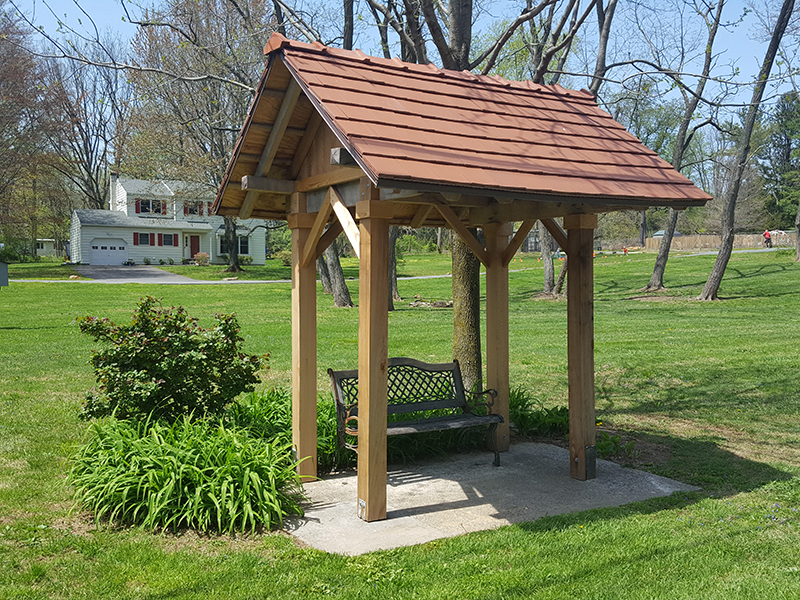 We call this a completed project, but it continues to be improved, thanks to Rose Valley’s own Boy Scout Troop 272 and the volunteers from the Rose Valley Centennial Foundation. In 2015, wiring was installed to light the fountain and mercer tile work on the Heritage Garden and to provide wall washers the Will Price pillars on Rose Valley Road. Those lights should be operable this year. A system to pump water from Vernon Run to replenish the water that evaporates from the fountain was also completed this year. 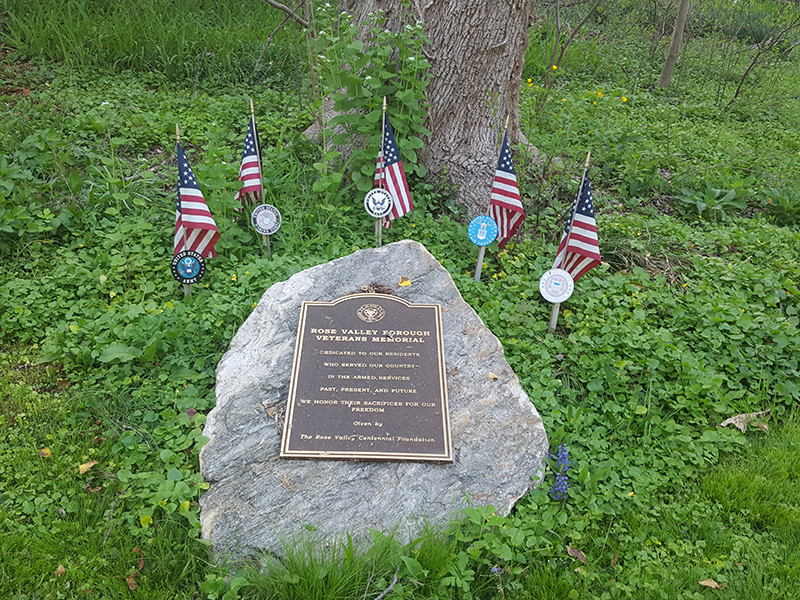 And flag markers bearing the insignia of all the branches of the service represented by current and former residents of Rose Valley were permanently installed behind the Veterans’ memorial thanks to the cementing skills of Bill Hale. 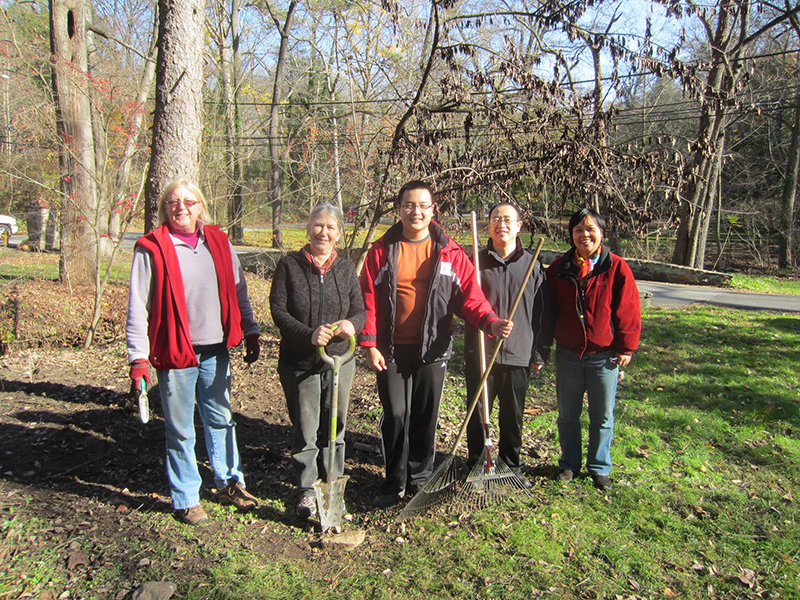 Under the guiding hand of our landscape designer, Margery Howe, the Scouts removed more invasive plants from the banks of Vernon Run and the bank behind the Veterans Memorial and planted native plants. 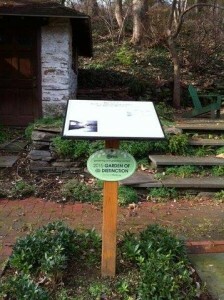 Stop by this spring to see the endless season of color and interest this work will provide. All this work has been done at no cost to the Borough of Rose Valley, which owns the site, or to The Rose Valley Centennial Foundation thanks to the Boy Scout’s fundraising efforts. 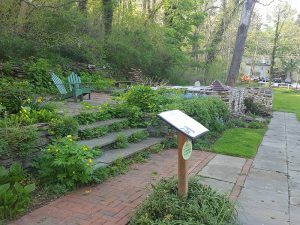 Finally, despite it fledging status, the Pennsylvania Horticulture Society named the Rose Valley Heritage Garden and Veteran’s Memorial as a Garden of Distinction in its 2015 Gardening and Greening Contest. The judges asked that we invite them back in a few years when the plantings have matured as they saw a real blue ribbon winner in the making. Garden Maintenance Chair Gail Hale, Designer Margery Howe, Eagle Scout Candidate Kevin Yin an Kevin’s parents led the native plant project, just one of several improvements made to the The Rose Valley Heritage in 2015. Phase 2 of the Rose Valley Heritage Garden and Veterans Memorial is Underway. Click here to read about Phase One. The Rose Valley Heritage Foundation appreciates the efforts of Rose Valley Troop 272. The hard work of the scouts and their leaders, who are donating not only the time, but the material for this second phase of improvements, have moved this project toward completions years ahead of the RVCF original timeframe. 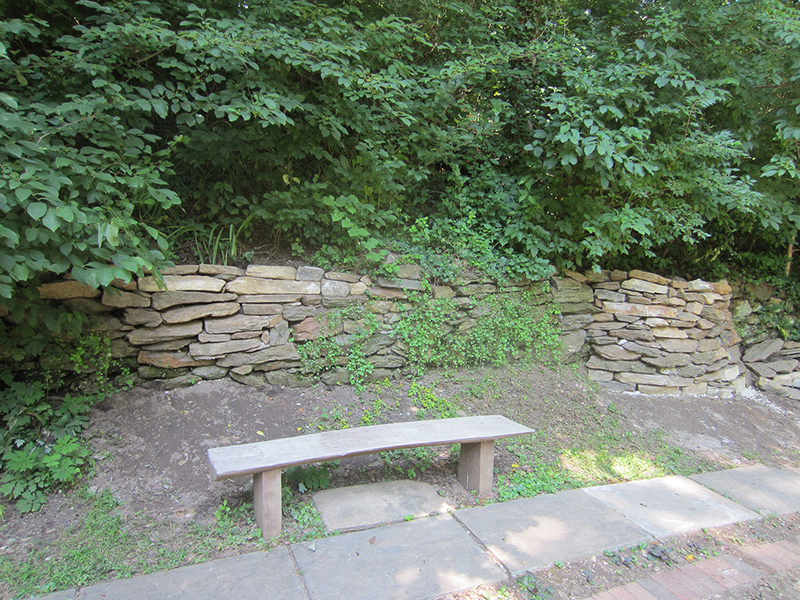 Ryan’s project also included the repair of the stone retaining wall above the Gatehouse ruins. Special thanks to Aaron Smucker of Weaverland Masonry of East Earl, the company that repaired and repointed the ruins for us last year. Aaron was “magically” working at the house next door and stopped by to give the Scouts some instructions on how to make their repair secure. And to Traymore, for donating stone from the dry stacked wall that was just removed to completed improvements for that community’s last 5 homes. 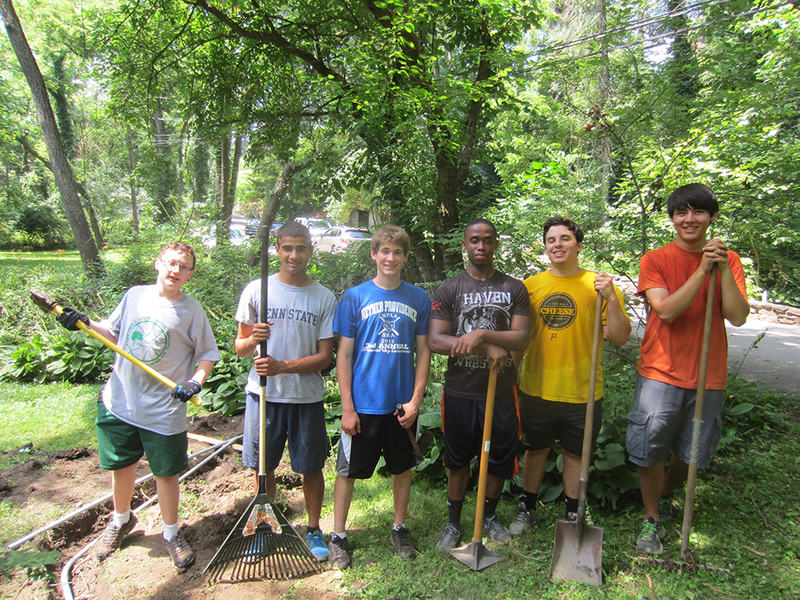 Ryan Dostillio (center in blue shirt) is one of two Boy Scouts who will complete his Eagle Scout project at the Rose Valley Heritage Garden and Veteran’s Memorial. 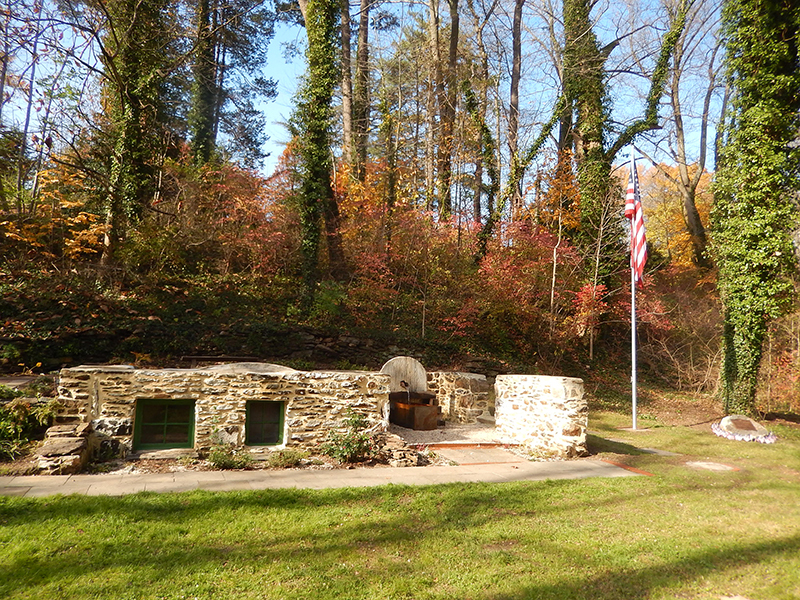 His portion includes rebuilding the stone retaining wall behind the gatehouse ruins and providing low voltage lighting on the fountain, the Mercer tile RV on the garage and the Will Price pillars at the end of Old Mill Lane. An Eagle Scout project is intended to show leadership skills, and Ryan did a fine job in leading his fellow scouts in completing his project despite the 100 degree weather. Special thanks to Dan Seifrit, of Seifrit Electrical Associates in Wallingford, PA for the donation of his time and materials to make this project possible. was completed and dedicated on November 9th. See pictures and a report of that ceremony here.